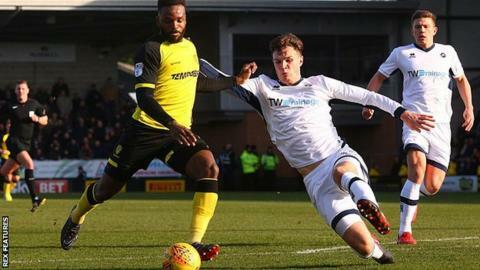 Millwall climbed to 12th in the Championship thanks to Ben Marshall's second-half goal against struggling Burton Albion. Burton had the better of the first half, with Lucas Akins shooting over and Darren Bent missing two good chances - notably when he blazed wide after running through. Hope Akpan also headed wide before Millwall improved after the interval. And Marshall earned victory when he bundled the ball in from close range. Burton, who drop to second from bottom after Barnsley won at Birmingham, threatened to grab a point late on. But both Lloyd Dyer and Tom Naylor were off target as opportunities came their way. "Over the course of the game and with the chances we created and the manner of the winning goal, it's a very poor result. "Players are human and they miss chances. We had enough chances at Ipswich, here against Forest and today to win all three games. "The most disappointing thing today is that we have lost it to a fluke of a goal. I am not quite sure how we have lost." "We have no fear of the division anymore. Four in a row away from home and anyone that has seen us all season, we could easily have double that on the road. "That was probably our worst performance on the road this year, barring Norwich. "I certainly felt that Burton should have took something out of the game. I have to give the credit to my players for finding another way of winning a game." Match ends, Burton Albion 0, Millwall 1. Second Half ends, Burton Albion 0, Millwall 1. Attempt missed. Tom Naylor (Burton Albion) header from the centre of the box is close, but misses to the left. Assisted by Jacob Davenport with a cross following a set piece situation. Lucas Akins (Burton Albion) wins a free kick on the left wing. Tim Cahill (Millwall) is shown the yellow card for a bad foul. Foul by Tim Cahill (Millwall). Offside, Millwall. Shaun Williams tries a through ball, but Tim Cahill is caught offside. Darren Bent (Burton Albion) wins a free kick in the attacking half. Substitution, Millwall. Jason Shackell replaces Lee Gregory. Foul by Hope Akpan (Burton Albion). Hope Akpan (Burton Albion) wins a free kick in the attacking half. Attempt missed. Shaun Hutchinson (Millwall) header from the centre of the box is close, but misses to the left. Assisted by Shaun Williams with a cross following a corner. Substitution, Burton Albion. Luke Varney replaces Martin Samuelsen. Corner, Millwall. Conceded by Kyle McFadzean. Foul by Lloyd Dyer (Burton Albion). Corner, Burton Albion. Conceded by Shaun Hutchinson. Offside, Millwall. Jed Wallace tries a through ball, but Lee Gregory is caught offside. Substitution, Millwall. Tim Cahill replaces Steve Morison. Attempt missed. Tom Naylor (Burton Albion) header from the right side of the six yard box is just a bit too high. Assisted by Lucas Akins with a headed pass following a corner. Corner, Burton Albion. Conceded by Jake Cooper. Jacob Davenport (Burton Albion) wins a free kick on the right wing. Jed Wallace (Millwall) wins a free kick in the attacking half. Jacob Davenport (Burton Albion) wins a free kick in the attacking half. Attempt missed. Fred Onyedinma (Millwall) right footed shot from the left side of the box is close, but misses to the right. Assisted by George Saville. Lloyd Dyer (Burton Albion) wins a free kick in the defensive half.